At last the much awaited day of the Vegetable Contest has arrived. Mother Nature smiled on us, the day remained nice and dry. Our Little Gardeners arrived 30 minutes early to harvest their vegetables with the help of their parents. We have to make sure their entries will pass Quality Control. 3 onions of uniform size were washed thoroughly to remove the soil, root hair must be trimmed and the green part trimmed 3-4 inches.Uniform size and shape and color is important. 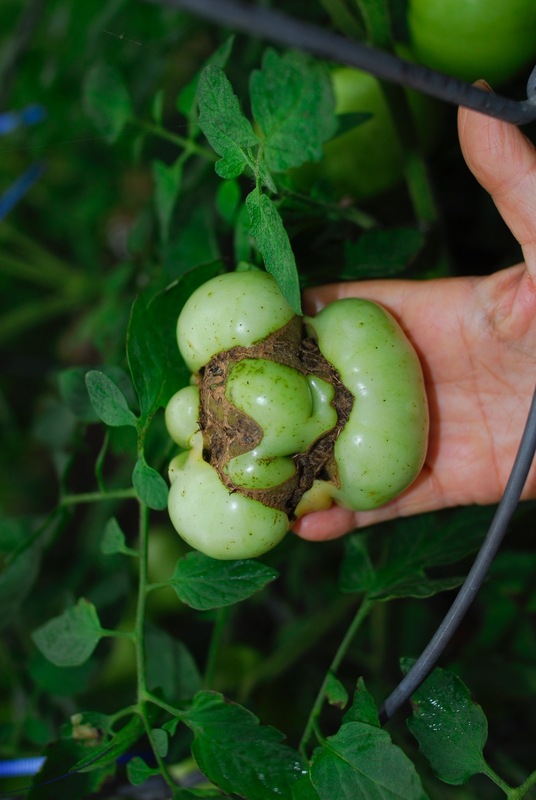 Tycoon or BHN 968 tomatoes can be entered, 3 potatoes either Red La Soda or White Kennebec can be entered making sure the entries are clean and as close to same size as possible, the same for the 3-5 green beans entry. Cabbage entry must have all outer leaves removed, 1-2 zucchini squash must be uniform in size and shape and must be free from insect or physical damage.A silly vegetable of any variety misshapen or irregular in size that may look like a face, pants, corkscrew etc may also be entered. Each contestant is allowed to enter one entry per vegetable category for a total of 4 entries. Note: Bigger is not necessarily better. Individual entry forms must be filled out for each vegetable entered in the contest and must pass through Quality Control to make sure we can take the entries to the Sunday House for the judging. The judging will take place between 10:30 and 11:30. While the judging is taking place parents and volunteers are busy preparing for the picnic. Parents and volunteers brought a dish to share. One parent brought these wonderful dessert for everybody to share, perfect for this occasion. Such talent cannot remain unnoticed. The appreciation ceremony and recognition ceremony took place after the judging. All of our gardeners received their participation certificates and the grand prize winner for the Spring Vegetable Contest is Joseph Williams. Sad to say we are still waging our battle against the pesky bugs as evidenced by these pictures. I could not find the nasty little creatures, I am sure they knew I was looking for them so they went into hiding. 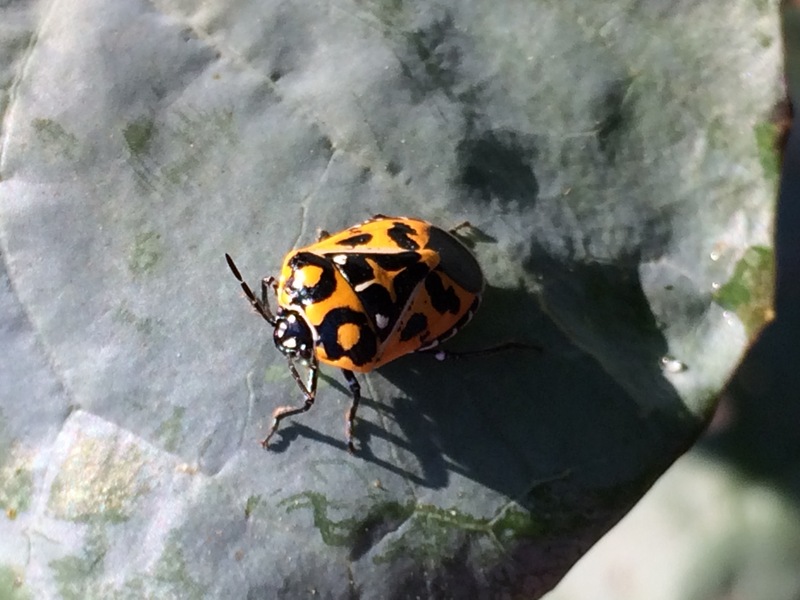 Holes in leaves might be from cucumber beetles or cabbage loopers which we hand pick and squish when we find them. Catface is another tomato problem which we encountered. It is severe scarring on the end of the fruits, usually found in large varieties. The most common cause is temperatures below 50 degrees during flowering & fruit set. 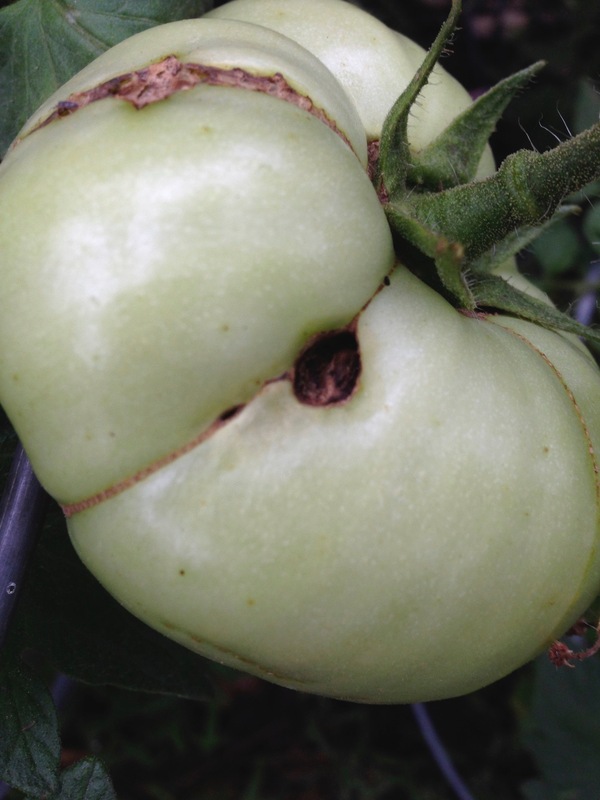 Low temperature inhibit pollination and cause the blossom to stick to the developing fruit thus preventing certain parts of the fruit from developing & scarring & indentation will take place. The unaffected part will continue to grow. The taste is not affected, I have fried my green catfaced tomatoes – delicious as ever! Our day started with the task of pulling the weeds to make sure the organic fertilizer goes to the plants instead of the weeds. We found out that it is a never ending battle with the bugs as evidenced by what we saw today. Are we going to win this battle, you bet we are!!! 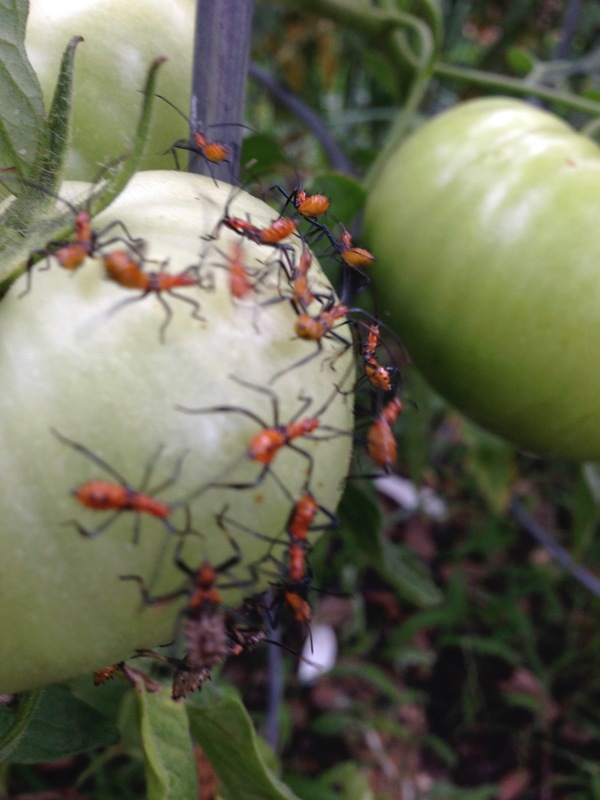 We found nymphs of the leaffooted bugs feeding on the foliar tissue & tomatoes, piercing the fruit with their proboscis and sucking the juices thereby causing distortion & discoloration. Spinosad will take care of the nymphs and adults but squishing the eggs with gloved hands eliminates the nymphs from hatching. 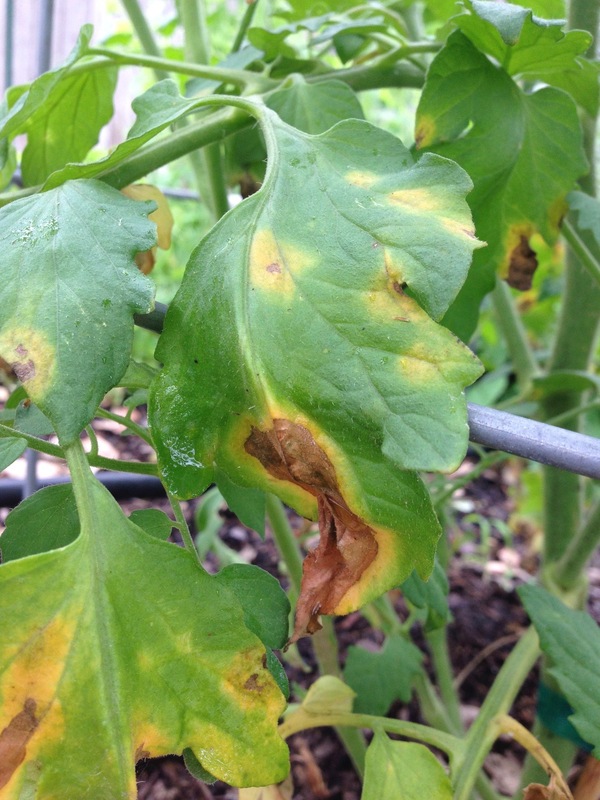 Another problem we encountered is the early blight on tomatoes that is caused by a fungus which overwinters in the soil. Lower leaves turn yellow & brown. Early blight is more common after periods of heavy rainfall & humid weather & we have had a lot of heavy rainfall and humid days. The best control is prevention. Remove & destroy infected leaves & treat organically by drenching with fungicide until leaves are dripping, at least once a week. 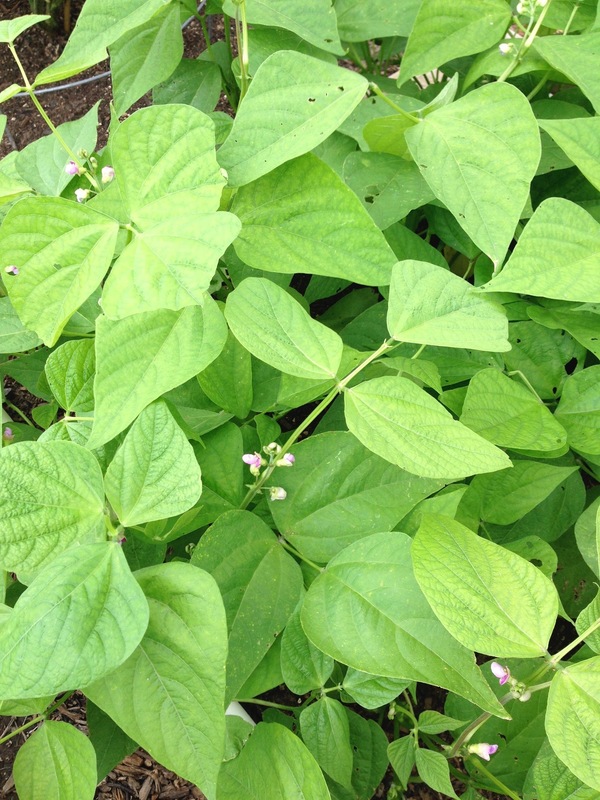 Rotate crops for the fall season, early blight remains active for one year and be sure to water the soil NOT the plants. Tycoon tomatoes are producing large beautiful fruits and some of the BHN 968 are ready to be harvested today. Some onions will be harvested today also. The ‘Cheers’ head cabbage will be perfect for next week’s vegetable contest, the yellow squash with their blooms have spread out & we can see little squash peeking out from under the leaves getting ready for the Vegetable Contest next week. The ‘Diva’ cucumbers are blooming and climbing their trellises reaching out trying to touch the face of the sun. At the end of the day the cucumbers will be drenched with spinosad, I just know we will win the battle of the bugs! At the end of the day we fertilized the plants with Hasta Gro, 1 oz.per gallon of water.The violet carpet petunias are blooming more profusely today due to being dead headed last week. 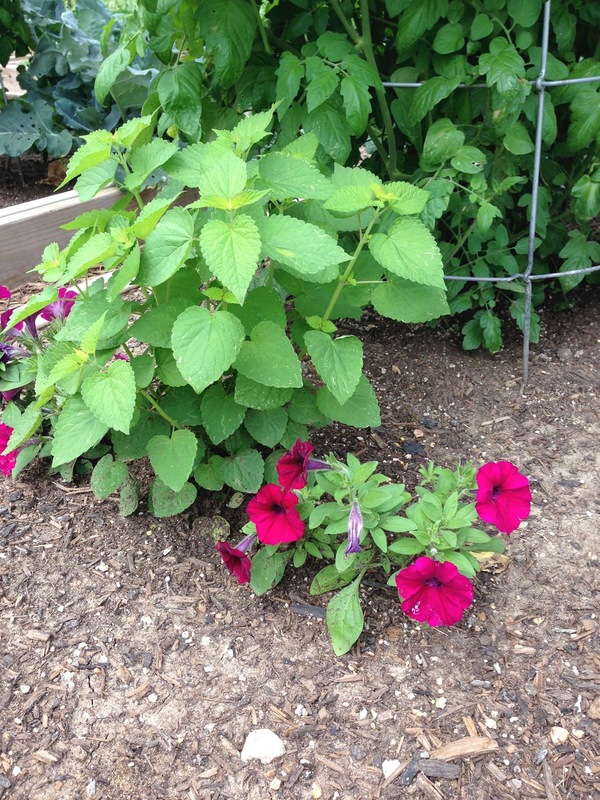 Dead heading or pinching off spent blooms to prevent the seeds from developing will produce more flowers. White Stream Lobularia – 1/2 gallon. Yellow Squash – 1 gallon. 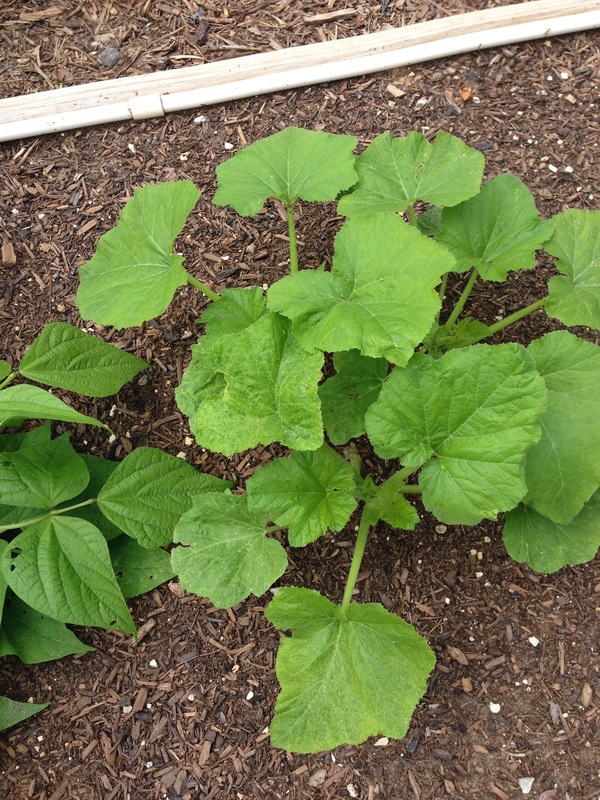 Diva cucumber – 1/2 gallon. It’s really worth taking the time to look over your plants and catch bugs in the egg stage, before they hatch and start to do damage. Remember the harlequin bugs? (I know I won’t forget them for a while. 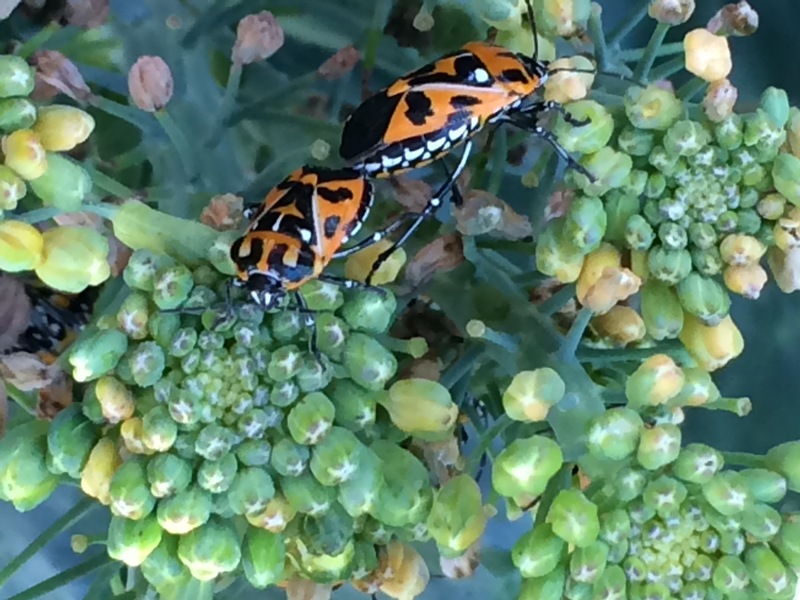 J) They were also busy laying eggs, which are black and white. See how small they are? I much prefer identifying insect eggs to hatched bugs because they don’t move around and are easier to squish once you know what they are. J By the way, a really good book for identifying bugs is Texas Bugs: The Good, The Bad, and the Ugly by Garrett and Beck. In order to better control our unwelcome visitors–in addition to the pick-and-smoosh technique–we treated the plants with liquid spinosad (diluted per the instructions on the bottle) right before we went home. 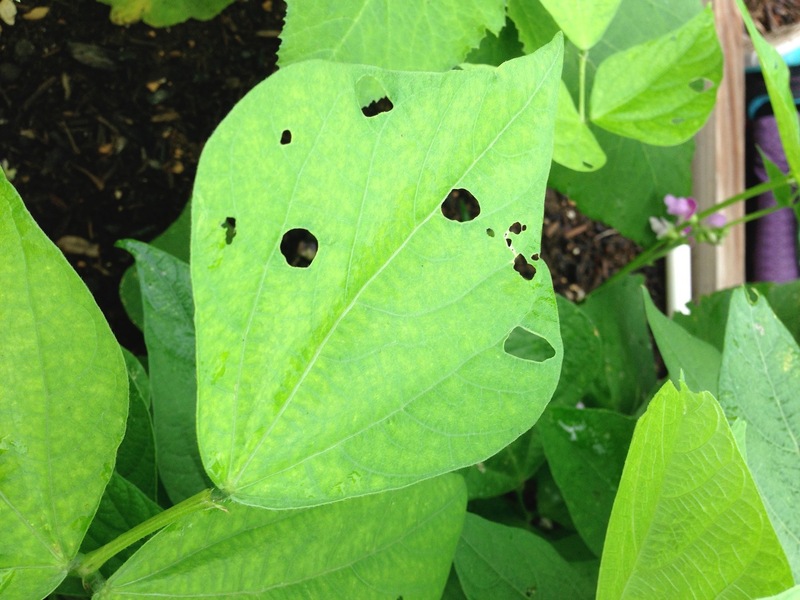 Spinosad is most effective when eaten by insects (adult or larvae) as they eat the leaves which were sprayed, but can also kill eggs if they are directly contacted by the liquid. Yes, the ‘Provider’ bush green beans were still in the walkway but we went on to them next! We put 3 bamboo stakes spaced out along each side of the bean area, and ran a string around the six stakes. A good way to do this is to tie the string to your starting stake, then loop it around each of the other stakes, tying it again when you get back to your original stake. This helps keep a good tension and keeps the string from sliding down. If you notice, the bamboo stakes are not very tall so if you buy tall ones you can cut them in half. Doesn’t this look much neater? Our ‘Diva’ cucumbers are flowering, and we made sure that their tendrils were latching onto the trellis. See how good the yellow squash look! If you remember, we originally planted three seeds, spaced apart into a triangle shape. Some of the beds were a little slower to germinate their three seeds, so to be safe we planted extra ones, and now in some we have more than three plants. In those beds, we thinned it out to the three healthiest plants. Why not leave them all? Several reasons. They would compete with each other for nutrients. 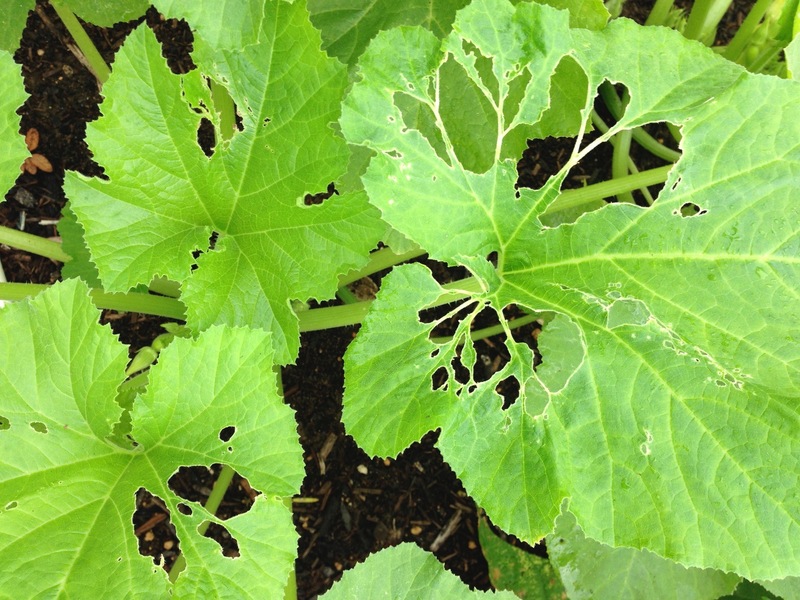 More plants means more leaves, so air circulation would be reduced, and fungal diseases like powdery mildew—which squash are susceptible to-would be more likely. Also, overcrowding limits the sunlight that reaches the leaves too (remember photosynthesis?) and the water that reaches the ground (and roots). Look! Our first blush of color on the ‘BHN 968’ cherry tomatoes!!!! I was pretty excited to see this, as well as how healthy the tomato plants are. The Tycoon tomatoes (on the right) are also doing very well; since they are larger tomatoes, they are still green and growing. Here’s one of our gardeners standing in front of her ‘BHN 968’ tomato plant…the plants are huge and full of cherry tomatoes! Fertilizing, as usual, is a very important part of a successful vegetable garden, and we did feed our onions with 2 cups of organic granulated fertilizer. Each of our tomatoes got half a cup of organic fertilizer placed around the outside edge of the large tomato cages surrounding them. Remember to water in the granulated fertilizer, as well as watering any of the other plants that needed it. P.S. Isn’t this a lovely head of cabbage? Due to a heavy rains we were unable to tend to our vegetables on April 25, 2015. On Wednesday, April 29 I went to the gardens to see how our plants were doing. Thankfully all the plants look healthy and I did not see any damage from the heavy deluge. I cleaned up the plots , removed the dry & yellowing leaves from all the plants to prevent unwanted bugs from making their homes on our plants. 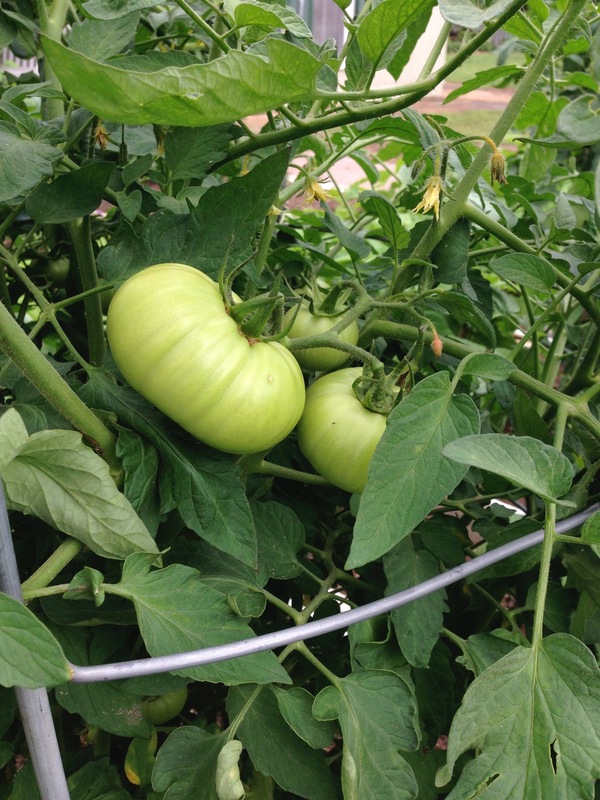 We have good size Tycoon & BHN 968 tomatoes which should be ready for the May 16 vegetable contest. 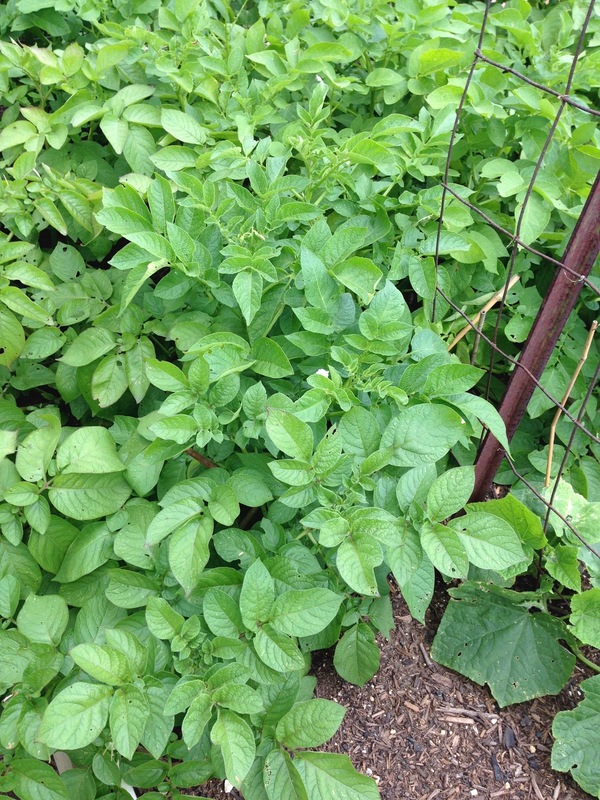 The healthy Red La Soda and Kennebec potatoes are so large that they are all leaning over the walkways so we will hill up the plants this Saturday . Once that is done the potatoes will be more upright. 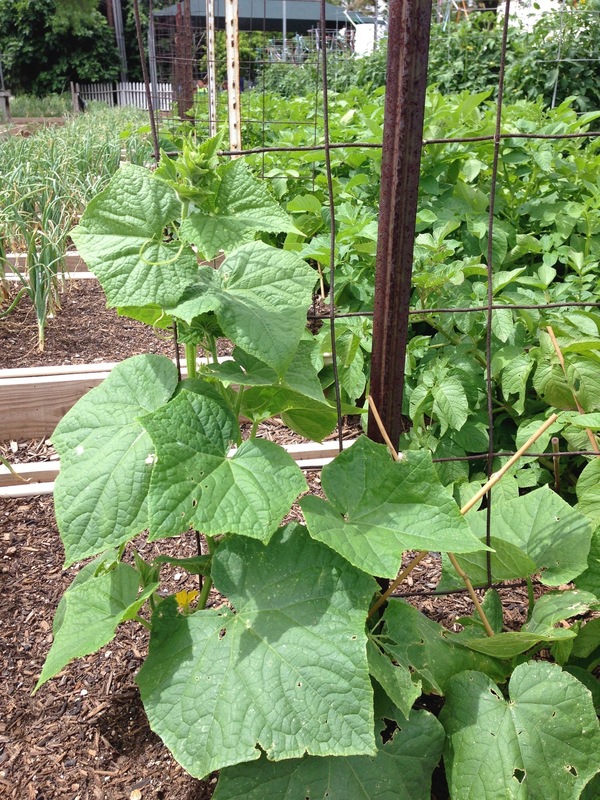 The beans are putting out blooms, the same with the cucumbers that are making their way up the trellises. The squash have all germinated and come Saturday we will remove the unhealthy plants and keep 3 healthy ones. Some kale and broccoli side shoots will have to be harvested this coming Saturday, the cabbage have large beautiful heads but we still need to be on the look out for cabbage loopers. Petunias are growing well & putting out more blooms, and come Saturday we have to make sure that the spent blooms are dead headed & this will give us more blooms in the coming weeks. We need to pinch off a few stems on our Anise Hyssop/ Licorice Mint , it will be delicious added to salads. Some of the edible leaves & blooms of the White Stream Lobularia will be harvested on Saturday also. I bet the children will be surprised that the blooms and leaves can be eaten.